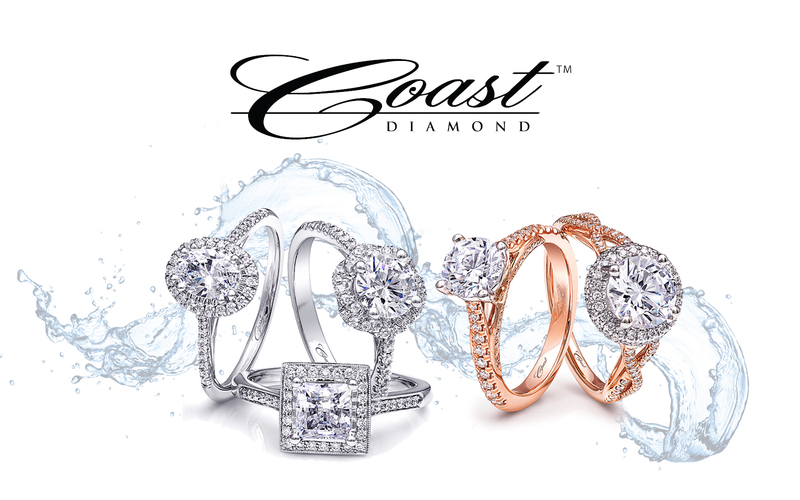 Coast Diamond is proud to select Diamond District of Estero, Florida as our Featured Retailer of the Week. When you stop into Diamond District at Coconut Point you will very likely have the opportunity to be served by the founders, Jason and Todd. Their passion for their customers and the diamonds they offer, keep them excited to be present to provide their customers with gorgeous diamonds and the very best shopping experience possible. Jason and Todd opened Diamond District thirteen years ago, but they have known each other since their days as coworkers at a jewelry retailer in Ohio. Their individual expertise complimented each other as that retailer grew and when they saw an opportunity, they decided to venture out on their own. Jason and Todd base their business model on offering what customers desire year round, loose diamonds and diamond jewelry. This disciplined focus has allowed them to offer diamonds at or below prices you will find on the internet or in retail stores. Diamond District has flourished into a 4,000 square foot showroom offering their staple of loose diamonds and diamond jewelry, but also fashion jewelry and men’s gifts. Visit Jason and Todd’s Diamond District today and you will find these and other classic and romantic Coast Diamond rings. Pick the perfect Coast Diamond setting and let Jason and Todd help you find the perfect center stone or fall in love with the fabulously trendsetting stackable bands Coast Diamond has to offer. Diamond District: Coast Diamond classic six prong round diamond engagement ring (LC5250) with diamonds cascading down the shoulders and matching flush wedding band (WC5250). Congratulations Diamond District of Estero, Florida for being selected Coast Diamond’s Featured Retailer of the Week! Coast Diamond is pleased to announce Browning & Sons Fine Jewelry of Hinsdale, IL as our Featured Retailer of the Week. Browning & Sons Fine Jewelry has been a Hinsdale staple for 25 years. It began with Rachel Browning’s desire to “make people sparkle” and continues with her appreciation of family values and her passion to provide heirloom jewelry to be passed down for generations. Attention to detail and knowledge of the jewelry industry make shopping at Browning & Sons a family tradition, generations over. Browning & Sons strives to build relationships with their customers, so they can provide each customer with exactly the look, feel or stone that fits the occasion for their gift of beautiful jewelry. Browning & Sons also provides several services that keep their customers coming back. These services include: polishing, custom and redesign, appraisals, repairs, watch repairs, engraving and more. Browning & Sons is an authorized dealer of Coast Diamond jewelry and carries the trendsetting Coast Signature Color Collection for their family of customers. The Signature Color Collection includes an array of impeccably crafted, one-of-a-kind rings, earrings and pendants. These pieces are made with fine sapphire, ruby and other precious gemstones, personally selected by Coast founder and designer, Jay Gilbert. Stop in to Browning & Sons today to choose one of these gorgeous Signature Color pieces for your loved one. Congratulations to Browning & Sons Fine Jewelry of Hinsdale, IL for being Coast Diamond Featured Retailer of the Week. Coast Diamond has the honor of naming Providence Diamond Co. of Cranston, Rhode Island our Featured Retailer of the Week. The Pritsker family are the proud proprietors of Providence Diamond Co. Peter Pritsker began in the jewelry business over 30 years ago as a representative for one of the largest diamond importers in the United States. In 1984, along with his wife Marcia, Peter opened his own, by appointment only, diamond jewelry store. Five years later they opened their first retail jewelry store specializing in fine jewelry and… diamonds, of course. Today, Providence Diamond Co. is proud to be one of the largest independent family-owned diamond jewelry stores in New England. Interesting fact: Providence Diamond Co. is one of 170 Couture Jewelers in the country. Couture jewelers are the elite in the business. They “embody the essence of creativity and original design.” By consistently providing their customer with the ultimate in product and service, Providence Diamond has earned Couture status. Valentine’s Day is just a week away and we’re sure you are in need of the perfect gift for your loved one. Maybe you are planning a Valentine’s Day proposal. Providence Diamond Co. is the perfect place to do your shopping. Stop in and feast your eyes on these stunners… Coast Diamond engagement rings, and enjoy the experience of shopping at a Couture Jeweler for yourself. Providence Diamond Co: Coast Diamond classic engagement ring (LS15001) with diamonds leading up to a 1 CT round center stone (wedding band WS15001). Providence Diamond Co: Coast Diamond romantic round halo engagement ring (LC10311) with delicately set diamonds on the shoulders. Providence Diamond Co: Coast Diamond glamorous halo engagement ring (LC6020) with a split shank encrusted in diamonds. Congratulations to Providence Diamond Co. of Cranston, RI for being our Coast Diamond Featured Retailer of the Week!